Blue 25mm festive pin badge design. 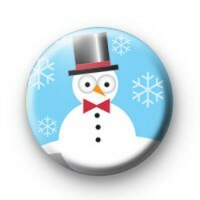 This Christmas badge has a very dapper snowman in the centre, wearing a top hat and a cute red bowtie. It is a lovely festive design and would make the perfect stocking filler gift, or to add some festive fun to your Christmas jumper or pop inside a Christmas Eve Box. Our Christmas Badges are all handmade and we have over 500 Xmas deigns to pick from, including other Snowmen, Santa Claus and funny Christmas Slogans so be sure to have a look through the Christmas Category before checking out.